One man’s dream will soon raise the world’s awareness about the complexity of water challenges occurring in India. 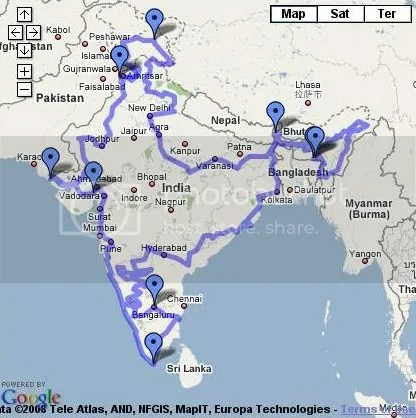 Beginning Saturday April 26th in Bangalore, CS Sharada Prasad will travel 19,000 km (11,807 m) on motorbike to document the meaning and encompassing challenges of water to people in India. Crossing 15 major rivers, 28 states, and 7 territories, Mr. Prasad will document his journey on a blog called “K2K – In Search of Water“. His route will be mapped with a GPS unit attached to his motorbike and uploaded to Google Maps. Geotagged blog posts will be updated everyday and photos from his journey will be available on EveryTrail and Flickr. The trip will take over two months to complete visiting places such as the Khardung La Pass at 18,380 feet to Kanyakumari at the southernmost tip of mainland India. Mr. Prasad will meet with local citizens, organizations, and community leaders to bring light to their accomplishments and challenges regarding sustainable water supplies. This event will be a great opportunity for students, classrooms, and people around the world to follow along with his adventure and become educated about water supplies in India. Sharada Prasad is a project officer for the India Water Portal developed by Arghyam, a non-governmental organization. Arghyam “seeks to support strategic and sustainable efforts in the water sector that address basic water needs for all citizens”. Visit the cool interactive Google Map of the Journey across India here. Purna Bahadur Vaidya is a Newar Poet from Nepal with a collection of “84 poems refracted through water” in the language of Nepal Bhasa called LA LA KHA (WATER IS WATER). 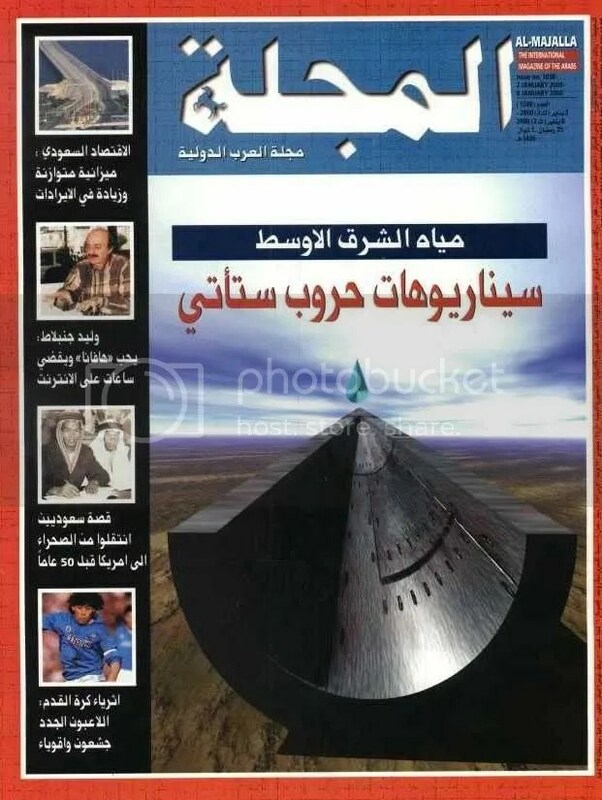 Wayne Amtzis (photographer and writer himself) sat down with the author to translate the poems into English. He has so graciously given permission for some of these translations to be featured on the Cultural Earth page on Water for the Ages. His translations have also appeared in The Drunken Boat, a web magazine of international works. In addition, the Library of Congress has recorded Purna Vaidya reciting portions of LA LA KHA in his native language of Nepal Bhasa. Photo above courtesy Wikimedia Commons. Mount Everest is the peak with the clouds to the left. Ama Dablam is the peak to the far right. In Africa, there is a young girl named Christina. She lives with her family in a small village in rural Ghana in West Africa. Ghana is close the equator with a tropical climate, but each year over eight months may pass without a drop of rain. During these dry spells, the one small pond in her village will slowly evaporate in the hot sun. Villagers are forced to seek water elsewhere. It is Christina’s job to fetch her family’s daily ration of water. Each day, she will walk up to four hours to gather enough water. Christina is a hardworking girl, but because she walks so far for water means she has no time to attend school. Christina is a real girl, and this is a true story as told in the short film below by Water Aid. Water Aid is an international organization with a vision of a world where everyone has access to safe water and sanitation. Intrigued? 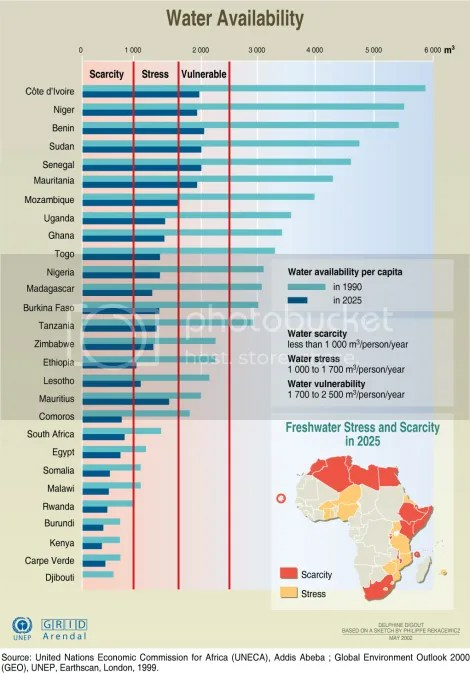 Read more about water in Africa below. Desert, rainforest, and savanna – over 900 million people live in Africa. It is the second largest continent in the world. Of all who live in Africa, 340 million people (38%) lack access to clean water and 500 million people (56 %) lack access to sanitation facilities. If you lived in Africa, you would have to walk an average of six kilometers (3.72 miles) to carry sometimes dirty or murky water home to your family for use. The burden of this chore often falls on the women and children of a household. The Nile, Niger, Volta, and Zambezi River Basins cross multiple political borders making water policy difficult and even volatile according to research conducted by the UN as featured on the BBC. In this “table-top” book filled with awe-inspiring photographs, authors from around the world contributed to each provide their own unique perspective on the water of the earth. Many prominent and knowledgeable individuals, such as Kofi Annan, Maude Barlow, Mikhail Gorbachev, Pete Seeger, and Desmond Tutu, each drafted a portion of the book. The Water Voices Web-site also hosts a blog for up-to-date information on the book tour and other global water issues. Is the Amazon longer than the Nile? The prospect of categorizing large rivers of the world was more difficult than one might imagine because of standing controversy regarding lengths of the supposed longest rivers of the world. Rivers are meandering in nature, changing shape, with tributaries that may be disputed as part of the original waterways. 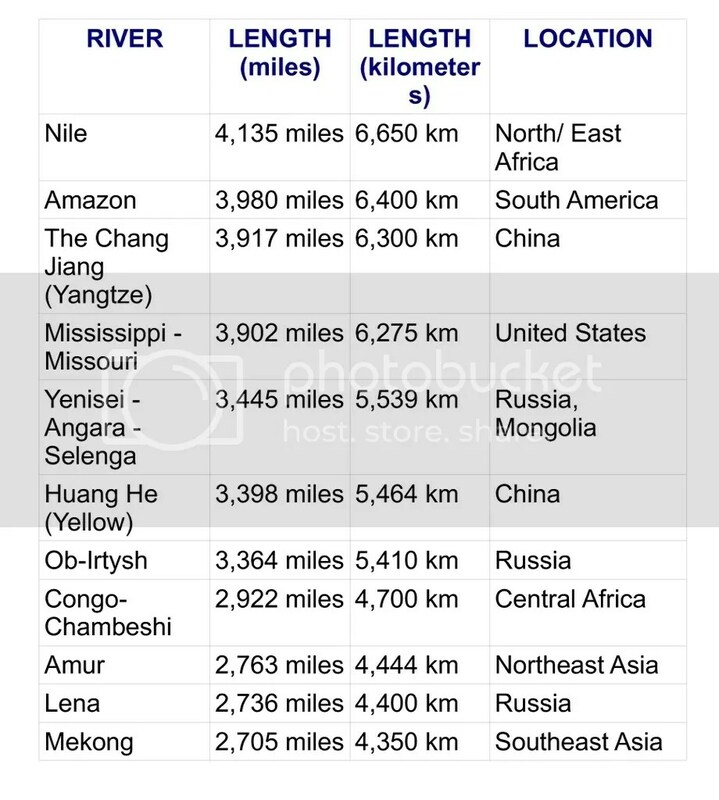 This list compiled on Wikipedia is great because it groups large river systems by length including the tributaries. Maybe, in the future, satellite images from space could be analyzed for an accurate portrayal of river length. Other compilations have differing views that list tributaries separately or highlight disputed tributaries. Now, geographers say, Is the Amazon longer than the Nile?